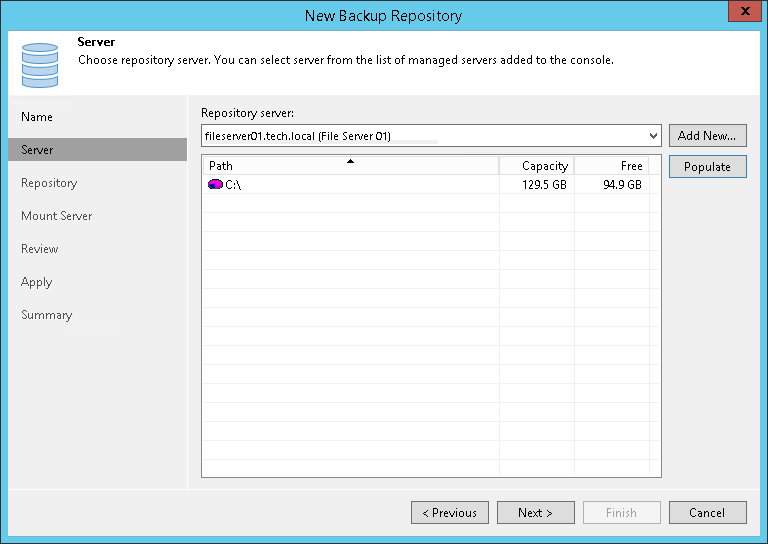 From the Repository server list, select a Microsoft Windows or Linux server that you want to use as a backup repository. The Repository server list contains only those servers that are added to the backup infrastructure. If the server is not added to the backup infrastructure yet, you can click Add New on the right to open the New Windows Server or New Linux Server wizard. Note that you cannot add ExaGrid or Quantum DXi servers as Linux backup repositories. ExaGrid and Quantum DXi are integrated with Veeam Backup & Replication, and thus must be added as deduplicating storage appliances. Click Populate to see a list of disks connected to the server, their capacity and free space. If a network connection between the source volume and backup repository is fast, choose Automatic selection. 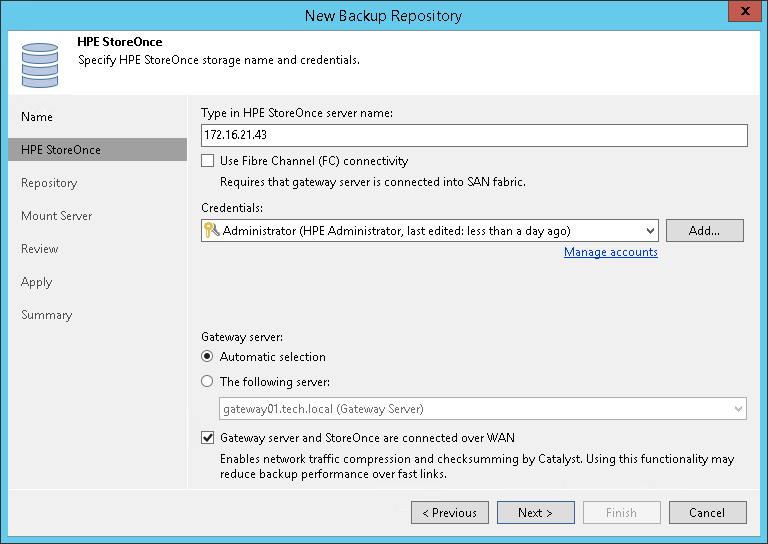 In this case, Veeam Backup & Replication will automatically select a gateway server. To use in-flight encryption between the backup proxy and EMC Data Domain, select the Enable DDBoost encryption check box and choose the encryption level — Medium or High. 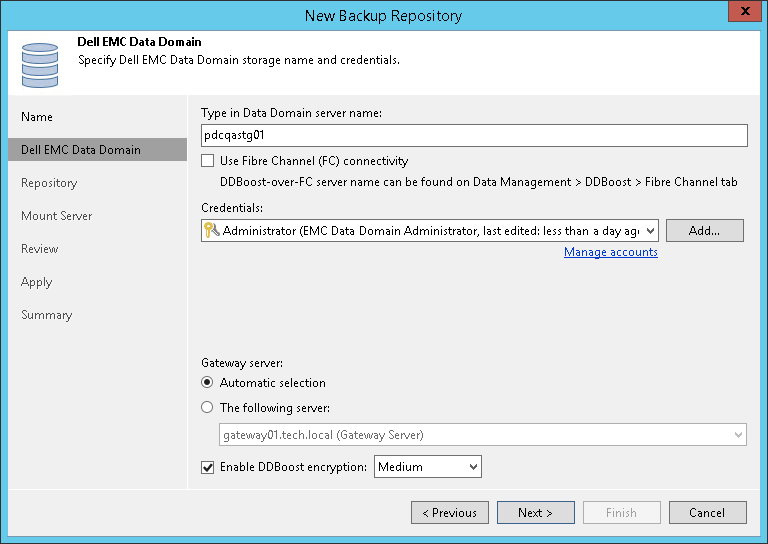 The encryption option works for EMC Data Domain 5.5 and later. If a network connection between the source volume and EMC Data Domain appliance is fast, choose Automatic selection. 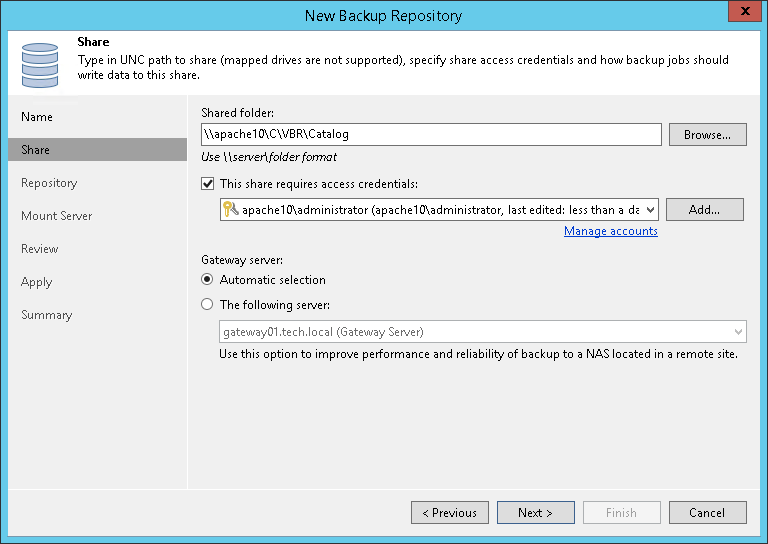 In this case, Veeam Backup & Replication will automatically select a gateway server. 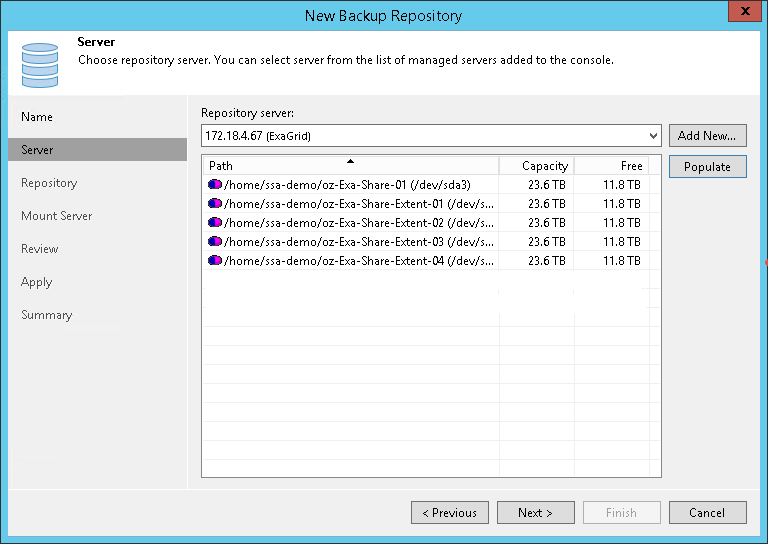 From the Repository server list, select an appliance that you want to use as a backup repository. The Repository server list contains only those servers that are added to the backup infrastructure. If the server is not added to the backup infrastructure yet, you can click Add New to open the New Linux Server wizard. For more information, see Managing Servers. In the Type in HPE StoreOnce server name field, enter a full DNS name or IP address of the HPE StoreOnce appliance. If a WAN connection between the gateway server and the HPE StoreOnce appliance is weak, select the Gateway server and StoreOnce are connected over WAN check box. Veeam Backup & Replication will compress VM data transported from the gateway server to the HPE StoreOnce appliance, and calculate checksums for data blocks going from the gateway server to the HPE StoreOnce appliance.